Our best-selling Smedley™ balls now in rubber. Happy, Sad, Frustrated, Surprised, Nervous & Shy. Helps kids express themselves through play. In our bright Spectrum™ colors! Our best-selling Smedley™ balls are now available in rubber. 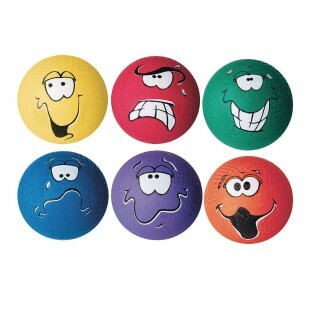 These 8-1/2" diameter rubber balls have 6 different Smedley™ faces: Happy, Sad, Frustrated, Surprised, Nervous and Shy. Set of 6, one of each Spectrum™ color. Colors may vary. We are an after school program so it is important to me that our balls are different than the schools. These check that box and the kids love the faces. Some will even sit and talk to the ball. terrible. they don't hold air. Merchant response: Our customer's feedback on their product experiences is vital and it helps us to identify problems. Your comments have been forwarded to the product team for review.